Thinking of Rep.-elect Alexandria Ocasio-Cortez (D-N.Y.), a rising star in the progressive wing of the Democratic Party at just 29 years old? Think again. Her name is Varshini Prakash, and at 25 years old, she serves as the co-founder and leader of the Sunrise Movement, a youth-driven grassroots effort to hold elected leaders accountable for a warming planet. "It's fundamentally about the future that our generation wants to grow up in," Prakash said in a recent interview. "We see this fight as being about our right to access good jobs and a livable future." The Sunrise Movement has made waves with its backing of the "Green New Deal," a progressive plan to wean the United States off fossil fuels, boost renewables and build a "smart" grid (Greenwire, Nov. 16). The group has lofty demands: It wants to revive a select committee on global warming in the House, which could produce draft Green New Deal legislation by 2020. It also wants incoming Democratic lawmakers to sign a pledge that they won't accept fossil fuel money. To build consensus around these ideas, the group staged protests this month in the offices of House Minority Leader Nancy Pelosi (D-Calif.) and Democratic Rep. Frank Pallone of New Jersey (Greenwire, Nov. 16). Activists visited dozens of additional Democratic offices across the country yesterday, from New Hampshire to California. But not everyone's on board. Disagreement is festering within the Democratic Party about the best way to address climate change in the next Congress, let alone to pass climate legislation — no small feat with Republicans controlling the White House and the Senate. Prakash was born and raised outside of Boston by parents who originally hail from India. 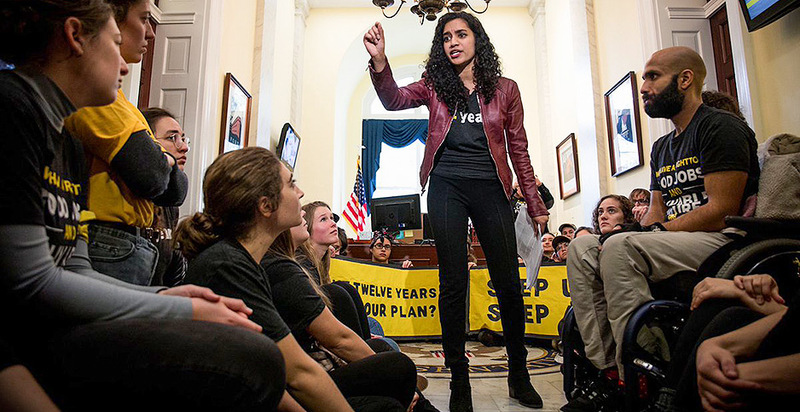 She attended the University of Massachusetts, Amherst, where she led the UMass Fossil Fuel Divestment Campaign, which declared victory after a two-week peaceful protest. She supported the creation of the Sunrise Movement this spring and now serves as lead spokeswoman. E&E News recently spoke with Prakash about making big demands, staving off the "climate crisis" and battling for the "heart and soul of the Democratic Party." Why did you decide to storm Pelosi's office? During the week preceding this action, there were massive fires happening in California. Forty-eight people had perished. Entire towns had been leveled. And the U.N. report on climate had come out, saying we have just 12 years to radically transform our economy and society at scale to stop the climate crisis. So a lot of us were really frustrated after the Democrats took back the House, when we heard Nancy Pelosi endorsing this bipartisan marketplace of ideas and saying she was going to revive this committee on climate change but not making other promises. It felt like this was grossly inadequate to address the climate crisis at hand. So we chose to do an action targeting Nancy Pelosi in order to say that we need our leaders to step up significantly on climate. What was your experience of the protest like? It was inspiring; it was emotional; it was moving. There were over 200 young leaders there, ranging from 17 to 35. It was so moving to see what young people are willing to do today to actually take action to stop the climate crisis. Oh, and Alexandria Ocasio-Cortez came to our action. It was really meaningful for the young people who were there to see someone who had walked the halls of power encouraging us and lending her support. Do you support Pelosi's bid to become House speaker again? Well, we're still figuring that out a little bit. Our line right now is that we really want Nancy Pelosi to back a resolution that was put forward by Alexandria Ocasio-Cortez to create a new committee called the House Select Committee for a Green New Deal. What do you mean exactly by a "Green New Deal"? Not everybody agrees on what it means. But to me and to Sunrise, when we talk about a Green New Deal, we're talking about the massive transformation of our society and our economy that we will need to stop the climate crisis and act in accordance with what science and justice demand over the next 10 years. That looks like a rapid wartime economic mobilization that gets us to a 100 percent renewable energy economy. It looks like ending fossil fuel subsidies. It looks like supporting the creation of tens of millions of good-paying jobs for Americans. And it looks like massive reinvestment in communities on the front lines of the climate crisis: communities of color and low-income communities. It would also include energy efficiency and retrofitting of businesses and homes. It sounds like it includes a lot. The list just goes on and on. It's a huge, massive undertaking. And a lot of this stuff sounds scary and technical and overwhelming. But the basic value underpinning a Green New Deal is that all people have a right to breathe clean air and drink clean water and live free from chaos, harm and violence. That is fundamentally what the Green New Deal is about, and that is fundamentally what we believe all people should have a right to on this planet. Is the term supposed to remind people of Franklin D. Roosevelt and the New Deal? It does harken back to that. I would say it has some significant upgrades. It inherently includes equity and justice at its core. Would you like to see a Green New Deal folded into a broader infrastructure bill, or would that be too watered down? I think that would be a great first step. If a massive infrastructure bill didn't include a climate component, I think that would be truly negligent. But also I think we can do more. How do you envision the Select Committee for a Green New Deal functioning? One of the issues with the committee that Pelosi has proposed is that it would be pretty toothless. It would have no actual funding. It would have no power to draft legislation. But the resolution that Ocasio-Cortez has put forward would give this committee the power to actually draft legislation and build more of the political consensus around what the real solutions to the crisis are. So the committee would work on the first major climate legislation since the Waxman-Markey bill in 2009. Right. Here's the thing: The last time that Democrats even made a major move to pass climate policy legislation was in 2009. That was almost a decade ago. I think I was 14 years old at the time. And we have seen nothing significant — especially nothing at the actual scale and scope of the crisis — since then. What do you make of Rep. Frank Pallone's opposition to the committee? Frankly, we don't trust Pallone's leadership at this time because he's taken over $100,000 from fossil fuel PACs [political action committees]. It feels hard to trust someone who takes money from the industry and who doesn't seem to be supporting a committee that would actually address the issue at scale. In addition to supporting the committee, you're also asking lawmakers to refuse donations from the fossil fuel industry. How politically feasible are your demands, given that Republicans control the Senate and the White House? With the committee, we're not planning on trying to ramrod any legislation through or anything like that, especially considering that Trump's the president and Republicans have the Senate. But we do think that it's imperative that we lay the groundwork now, given the timeline that we're working on. You've mentioned Ocasio-Cortez as a champion of your issues. Which other new Democratic members are you excited about? Sunrise actually endorsed 30 candidates this election cycle, and 19 of them won. All of them have taken the No Fossil Fuel Money Pledge, and all of them support aggressively working to stop the climate crisis. We're especially excited about incoming first-years like Deb Haaland [of New Mexico], Ilhan Omar [of Minnesota] and Ayanna Pressley [of Massachusetts]. We are really excited to engage with Ocasio-Cortez and others in this battle, which is really the battle for the heart and soul of the Democratic Party. Sunrise sees itself as a part of that, as pushing the party to first and foremost become a party of the people, not just of wealthy interests, and pushing the party to actually protect the interests of all working people — black, brown and white — for generations to come. Are there any Republicans you think your group or your members could work with? Potentially, yeah. We haven't had any come through the woodwork right now. And I think we'd need them to really back a Green New Deal or back a transition at the scale that we need. We haven't seen that yet. But I am definitely not putting it out of the picture. I'm from Boston. My family is from India, but I'm from Boston. Do some people take you less seriously because you're so young? [Laughs] Definitely. I mean, they all do, yeah. Being young, being a woman, being a woman of color. All of those things add up. But it doesn't really stop me because fundamentally we need to do everything in our power to change this world. And that's just where I'm at.